As the final minutes of her team's battle with Cox in the Eastern Regional title game at Old Dominion University on Saturday passed by far too slowly, Gayla Normile tried to make turning away Cox's offense her only priority. Normile and her Kellam teammates had never experienced a Region title (the school last won one in 2006, and Cox had monopolized the top spot ever since), and the Lady Knights clung to a 2-1 lead that they hoped would make enough of a difference. 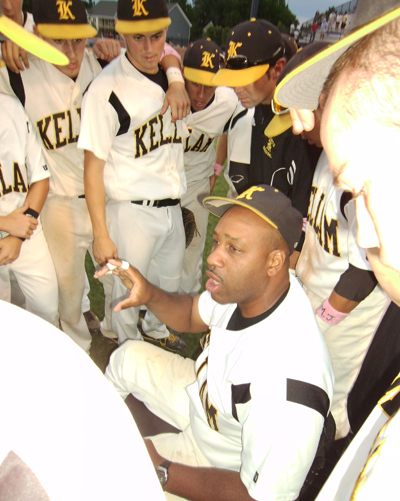 Kellam's last regional baseball title a decade in the past, St. Clair Jones sat in the ODU dugout, watching his squad face Nansemond River for tops in the diamond region. Like the girls, the Knights' advantage was slim, and a 3-2 lead could vanish with a few good hits. But even with this being one of the biggest days of everyone's respective athletic careers, it wasn't always easy to keep their minds on the game. Because over the past few weeks, or longer, things much more important than scoring goals and batting in runs had affected both teams. Before the season had even started, Normile and her teammates had reason to mourn when her baby brother Charlie drowned last year. Then her other brother James, a cornerstone of Kellam's male soccer squad, was killed in a car accident early in the season. It's something no one, no one of any age at any time, should ever have to face. But Normile's immediates weren't the only family to which she could turn. Her teammates and coaches labeled Normile's last name on the back of their practice shirts, and everyone kept making sure that she was feeling a bit better all the time, and that her brothers would never be forgotten. "When things don't go right, and things don't go your way, that's when the true character of a team comes out, and they did fantastic," said coach Mario Hurdle. "Good or bad, it's about us being together and a team and as a family. Losing James was very near to our heart, but I have the greatest bunch of girls in the world." A week before, Jones' mother Catherine had become one more victim of breast cancer. To the point that Saturday's game was played, no one, including Jones, knew if he'd make it to the game. But even knowing that the biggest games of their careers, against one of the top teams in the state, was coming up in mere hours, Jones' entire squad attended his mother's funeral earlier Saturday. It's where they got an unexpected source of inspiration. "The pastor at the service (said) that the whole thing was about never giving up in life," said second baseman Kyle Morrison, "and when the odds are against you, never giving up." About 10 minutes into the girls' game, Helene Schillo knocked a shot into the Cox goal. But just before halftime, Lauren Muncy slipped a shot past Kellam keeper Ballie Fout to tie things up and give the Lady Falcons some halftime momentum. "When you're the goalie and you make a mistake, it could affect the whole rest of the team and how they played," Fout said. "(But) I knew that my team could score again, and I had the confidence that I wouldn't make the same mistake again." After the funeral, Jones went home for a while. While his team warmed up in Norfolk, their coach finally made a decision. "I know they were exhausted," he said. "Having to go to a funeral, and come and (play), I knew they were tired. I thought about everything as the day went. They didn't quit on me; I wasn't going to quit on them." But when he arrived at ODU, his team was behind 1-0. As the second half got rolling, both teams, which had gone 1-1 in direct competition during the regular season, reached for the momentum, roaring up and down the turf. Then, about 10 minutes in, Schiilo found a new way through the Lady Falcon defense, taking a pass from Abby Morgan and untying the score at 2-1. In the bottom of the fifth, Kellam's Kyle Porter singled to right, and Morrison beat out a bunt. Kurt Sinnen loaded the bases with a single, and Tyler Nelin came in to pinch run for him. Nick Walker blasted a long sacrifice fly to center, and Porter scored. Then Christian Vylonis dribbled a grounder past the River mound, and second baseman Ty Brown's throw was a second too later, allowing Morrison to give the Knights the lead. Nelin scored on a wild pitch to give the Knights a 3-1 lead as the inning ended. But the Warriors weren't finished. Kyle Moore started the sixth by blasting a double down the left field line, and Colin O'Brien cashed him in with a single. Then Sam Sinnen struck out two to end the inning, leaving the Knights with just three more outs to get to the title. With a few minutes left, Kellam switched from three defenders to four, focusing less on scoring goals and more on preventing them. One of the lucky(?) four, Normile went for the stoppage. As she and her teammates knocked back one Falcon attack after another, Normile's intensity was at the roof. Then a teammate pushed her through it. "Know who we're playing for!" someone shouted. Knowing who she was referring to, Normile subconsciously knew what was going to happen here. Then an official's whistle blew. Then another, for a bit longer. Then one more. It wasn't an injury or a penalty. It was the end. The end of a game that everyone had vowed to win for reasons far outside their school. As her teammates charged everywhere and the hugging began, Normile sank to her knees and pulled her jersey over her head. Shedding tears had become sadly commonplace for her recently, but for the first time in far too long, these were tears of joy. She touched the armband tied to her arm, adorned with her brother's initials. She saw the family name emblazoned on the back of her coaches' shirts. The sun seemed to shine just a little brighter, and it might just have been because of two extra smiling faces staring down. Normile stood up, and went to join her teammates. With Kellam two outs from victory in the seventh inning, Travis Johnson singled to right field. A fielder's choice by Brandon Lowe got another out, but Lowe stole second and Zach Vann walked to get the Warriors within a base hit of tying the game. Pitching coach Justin Jones headed to the mound for a conversation with Sinnen. Jones may have been having flashbacks of his own; he was on the Kellam mound for the Knights' last regional championship of 2002 (Sinnen's older brother Brooks, a fellow assistant coach, was also on the team). "I asked him how he felt, and not to worry about the runners on base," Jones said, "to just go after that guy at the plate 100 percent. I was trying to get him fired up and pumped up." Moore stepped to the plate, and worked a few pitches. Then he smacked a hard grounder towards short. Nick Walker corralled it, and sent to Morrison at second. The ball reached the base moments before Vann, for the out - and the title. Watching his guys celebrate, Jones made his way toward the pitcher's mound. "We've never wanted to win this bad," Schillo said after hoisting the regional trophy in the air. "It's awesome. It's the best feeling in the world." She and her teammates will stay home and face Northwestern runner-up Broad Run next week, while Cox goes to Northwestern winner Battlefield. 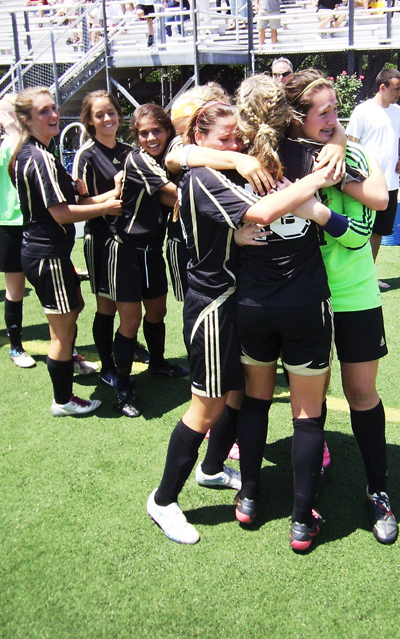 Cox has never won a state title; Kellam got one in 2005. "Since freshman year, we've wanted this, and for all the years for it happen, I'd want it be my senior year," said Mykala Planskar, one of four Kellam seniors. "We were pumped. There's been a lot of chat and competition, and it's always been a big deal who wins this. We had a lot to prove today, and I think we proved, more than anything, who we are." For the first time in far too long, Gayla had something for which to cheer. "In the beginning of the season, before the accident, it was about Charlie and playing for him," she said. "But after the accident, I knew I had to get right back into it, because I knew my team needed me and I needed them. It was a healing process for me. When I play, I play for both of them." Morrison and his guys were also there to pay one last tribute, to say thanks at least one more time. As he and his teammates crowded around the pitcher's mound, they flashed their own bands. Dyed in the shade of pink that symbolizes the battle America continues to fight against breast cancer, they also displayed a pair of initials: M.J., for Mother Jones, the true "team mother." "This whole tournament's been for her," Morrison said. "Everything since we found out she'd passed away has been for her. We knew we weren't going to lose." With his faithfuls crowded around him one last time - at least, until they face an undetermined opponent at home next week, while River heads elsewhere - Jones finally felt the same way. The team, he said, "has been more than supportive, and I'm not even talking about the wristbands and all that. This has been an emotional week. It is definitely an awesome feeling. It was about heart. It was about will."